The LAUSD teacher’s strike is over. A contract deal was reached and normal operations resumed the next day. Photo by David George. On Jan. 29, the Los Angeles Unified Board of Education voted unanimously (6-0) to approve the new contract with the United Teachers Los Angeles (UTLA). The contract includes a 6 percent salary increase for teachers, slightly reduces class sizes, and adds a “significant number” of librarians, counselors and nurses. The teachers and staff voted to approve the contract agreement, according to news reports. The two sides had met on Jan. 22 at Los Angeles City Hall and said they had forged a tentative agreement that provides a two-year bump in pay that totals 6 percent (retroactive for last year and this school year). Teachers and schools on Jan. 23 were returning to normal routines and operations, according to all accounts. Now awaits perhaps the biggest challenge of them all: the LAUSD has to obtain new outside funds, in order to pay for the additional costs of the new contract. That likely means an increase in local property taxes, and a financial bailout from the State of California, according to various news reports. Given the arrival of the new Governor, additional state founds are a strong possibility. Provides a 6 percent salary increase for educators. Reduces class size and adds nurses, counselors and librarians. Invests as much as possible while maintaining fiscal solvency. Provides additional opportunities for collaboration between the school district and union. The schools were open on Wednesday, “managed by skeleton staffs of administrators and employees who are not on strike, just as they were last week. More than two-thirds of students did not come to campuses during the first week of the strike,” noted the Times. Effective by norm day 2022, the district shall comply with the class size averages and maximums in Section 2.0. Privatization/Charter Cap: The Board of Education will vote on a resolution calling on the state to establish a charter school cap and the creation of a Governor’s committee on charter schools at the next BOE meeting. School Funding: UTLA, LAUSD and the Mayor’s office will jointly advocate for increased county and state funding. This includes but is not limited to funding for nurses, special education and community schools. The Mayor will also endorse the Schools and Communities First ballot initiative, and will work together with LAUSD and UTLA on advocating for the passage of this initiative. Community Schools: By June 30, 2019, the district will designate 20 community schools. By June 30, 2020, the district will designate an additional 10 community schools. These community schools will have additional funding and UTLA positions, including a Community Schools Coordinator position. Local School Leadership Councils at community schools will have full discretion over all budgetary items outside of School Site Council. Librarians: For the 2019-2020 school year, the district will hire 41 full-time Teacher Librarian positions. For the 2020-2021 school year, the district will hire at least 41 Teacher Librarian positions, which will provide a full-time Teacher Librarian at every secondary school campus five days a week. Counselors: The district will hire at least 17 additional full-time Counselors by October 1, 2019, allowing the district to maintain a counseling service ratio of 500-1 per secondary school. Special Education: 2 release days for testing, access to regular caseload reports, improved language on caseload caps, improved rights for SPED teachers. Early Education Workday: All Early Educators will have an 8-hour workday inclusive of a 30-minute duty-free lunch. It should be noted, though, that, “Because negotiations took nearly two years, much of the new deal covers a time period that already is past. The agreement, if approved, will expire at the end of June 2020, meaning that it soon will be time to bargain again,” said the Times. Last week, LAUSD announced it had already lost over $125 million to the labor dispute. That number should jump substantially this week. According to the LAUSD data, the average daily attendance revenues that are lost each day have ranged between $27 million and $28 million. The estimated total gross revenue lost for the first four days of the strike is $97 million. 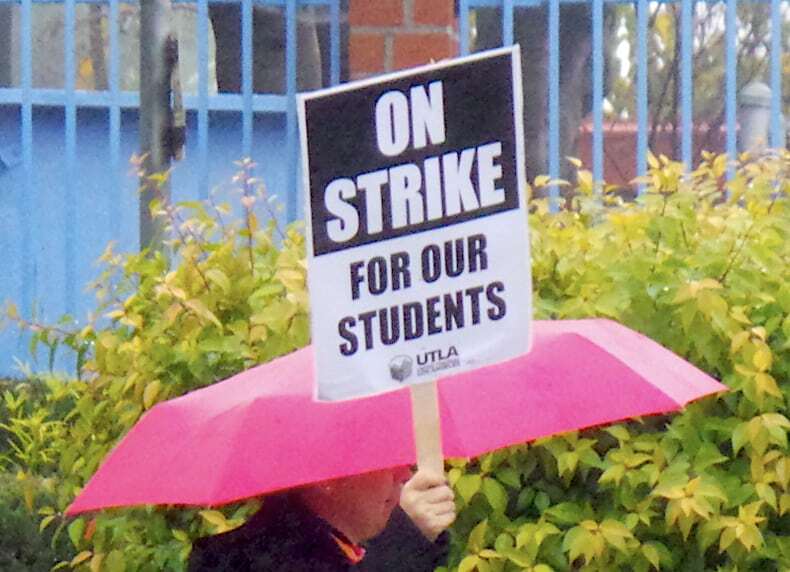 On Friday, however, LAUSD released a revised statistic that claimed that the total gross revenue lost for the first four days of the strike stood at $125.1 million, based on attendance numbers reported. On Wednesday, less than one-third of students showed up at school, the “lowest number since the strike began, according to preliminary attendance figures,” said the Los Angeles Times. Also on Wednesday, California State Superintendent of Public Instruction Tony Thurmond traveled to Los Angeles to meet with Los Angeles Mayor Eric Garcetti and leaders from both sides who are involved in the teachers’ strike, announced Cynthia Butler, an information officer at the California Department of Education. All 1,240 elementary, middle and high schools continue to remain open and school buses are in operation. Student attendance remains well-below normal throughout the district. Meanwhile, teachers at three charter schools in Los Angeles also went on strike on Wednesday, reported the Los Angeles Times. At a Tuesday morning news conference, LAUSD Superintendent Austin Beutner urged teachers to return to their classrooms after almost one-third of students stayed at home the previous day, which cost the district a net loss of $15 million, officials said. Because the district receives funding based on student attendance, “Beutner said the district lost about $25 million, and saved $10 million because of unpaid wages to striking teachers and staff who walked the picket lines on the first day,” reported the Los Angeles Daily News. Times education reporter Howard Blume wrote on Wednesday, “there will be increasing pressure for the union to settle as teachers lose salary, L.A. Unified loses money and the thrill wears thinner for families worried about lost learning time and how to balance childcare with work, politics with pragmatism. Ellen Morgan, LAUSD public information officer, told School Transportation News that, “All drivers reported to work, and all operations ran very well” on the strike’s first day. By Wednesday, she noted that, “We have experienced a slight decrease” in school bus pickups and operations. However, she said student ridership was down by 62 percent on Monday, Jan. 14, as many parents chose to keep their children home, rather than face unknown classroom situations. “On average, we transport about 22,000 students daily, and today, drivers counted 8,600,” she told STN. There were still the same number of routes, she reported, with no extraordinary issues or incidents arising so far. It was also reported that LAUSD hired 400 substitutes, with about 2,000 administrators with teaching credentials reassigned to teach classes. Daily updates on the labor negotiations are posted at LAUSD.net. LAUSD has more than 694,000 students enrolled in kindergarten through 12th grade. The district covers 710 square miles, and includes Los Angeles, plus all or parts of 31 smaller cities, and several unincorporated sections of Los Angeles County.